Yeh Rishta Shocking Naira to change her marriage decision. 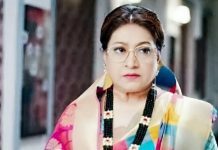 Dadi gets happy and blesses Kartik and Naira for their remarriage. The families hide the fact that they are already married. Naira doesn’t remember the entire truth and is happy that she is marrying Kartik. She asks her family why did they hurry to send her away and fix her marriage in a rush. Dadi tells them that Holi is close and mahurat is auspicious for the wedding. Naira pulls their leg. She doesn’t want them to delay more. Dadi decides the mehendi rasam. Devyaani invites Goenkas home and tells them that they will celebrate all the functions together as one big family. Naksh and Rishabh want to ask Kartik if he has told Naira the truth. Kartik apologizes to them and tells them that he loves Naira a lot and cares for her more than anyone else. Naksh tells Kartik that he has no option than to agree to elders. He warns Kartik that if Naira’s heart breaks this time, none can stop him from severing all the ties. The families don’t want Naira to have any doubts in mind. Naksh is happy for Naira. He wants to know why is Kirti upset. Kirti tells her that no one worries for her, everyone is happy for Naira’s happiness. She feels she doesn’t matter to anyone. Kartik and Naira have a sweet moment of romance. She tells him that she likes everything about him. He tells her that he will soon come to meet her in their mehendi ceremony. Naira wishes to be with him forever. Meanwhile, Rishabh gets angered and depressed that he lost Naira forever. He accepts that Naira just loves Kartik. He feels sorry for himself. He packs his bags to leave for his home. Naira doesn’t want him to leave and asks him to be a part of her happiness, her wedding and new phase. She doesn’t want him to miss her newly forming good memories. Kartik and his family try to hide everything that can remind Naira about the past. Kartik is going to make a new start by siding off the old baggage. Dadi doesn’t want Kartik to hurt himself by anything again. She wishes the best for Kartik. He is scared to know if everything will get fine. Kartik and Naira’s marriage picture goes with the mehendi shagun to Singhania house. Dadi assures Kartik that everything will be fine. Everyone looks forward for Kartik and Naira’s marriage happening for the third time. Naira shocks everyone by telling them that she will not marry Kartik. She tells them the reason, that’s Krish. She tells that she can’t live without Krish. Everyone laughs on her sillyness. Naksh tells her that she can take Krish with her for few days. Kirti doesn’t like this to happen. Naira doesn’t agree for the marriage. Kartik tells her that he will support all her decisions, they won’t marry if she doesn’t want. He asks her to confirm that she won’t marry him. She tells him that she will miss Krish a lot in Goenka house. She doesn’t want to leave Singhania house. Kirti gets frustrated by Naira’s stupid drama to get all the attention and also her new claims on Krish. Kartik tells Naira that he will become Ghar Jamai or they can take her entire family along so that the marriage doesn’t get cancelled. Naira doesn’t want him to make fun of her emotions. Kartik promises to get her to her family even at midnight, the moment when she misses them. Naira often recollects the past moments. The families don’t let her think of the past much. Kirti gets insecure watching Naira with Krish. Nobody realizes Kirti’s feelings and unhappiness. Kartik gives Krish to Kirti. Naksh taunts Kartik for trying to wash his sins. He reminds Kartik the dire consequences of Naira’s memory regain. Kartik asks Naksh to enjoy the marriage functions at least for the sake of Naira’s happiness.